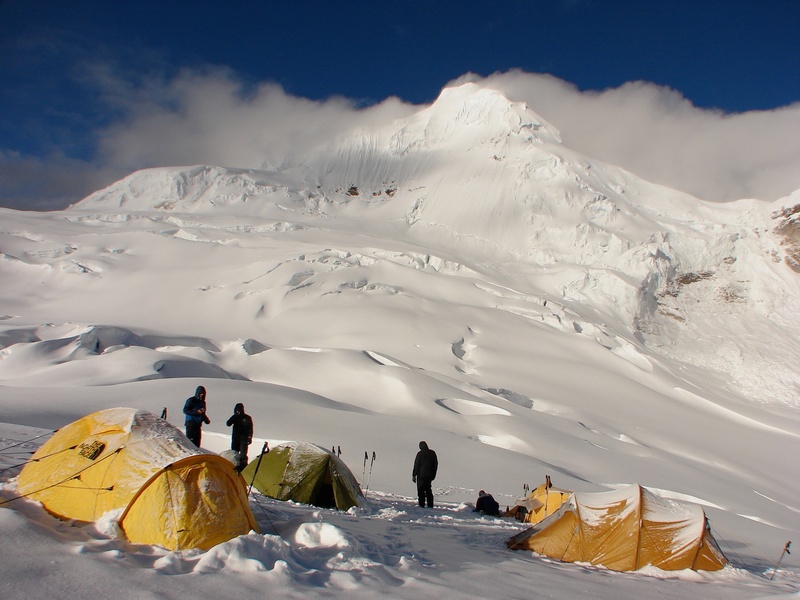 We got to the 5000 meter (19,000′ +) plateau at about 3:00 on a sunny afternoon- with lots of time to get the tents up, have some supper, inhale the incredible scene, and crawl into our sleeping bags before 6:30. If the weather held, the next morning at 2:45 we’d head up for the 20,065′ peak of Tocllaraju. I didn’t sleep much that evening! If standing on the top of a 6000 meter peak is on your list of want-to-do’s, then set your destination for the Cordillera Blanca, a mountain range in central Peru. Outside of the Himalayas, this range (contained within the overall Andes range) has the greatest number of 5500 meter (19,000 feet) peaks- 62 of them according to one count- anywhere in the world. To add to the majestic scale of the mountain scenery, 20 or so of these summits stand higher than 6000 meters. Using the town of Huaraz as my base, I spent fifteen days in the Cordillera Blanca at the beginning of the climbing season, which goes from mid-May to September. I had actually been in Peru for a week before I arrived in Huaraz. My Peruvian adventure began with a visit to South America’s #1 tourist attraction- the weekend estate of the Inca ruler Pachacuti, the world wonder of Machu Picchu. 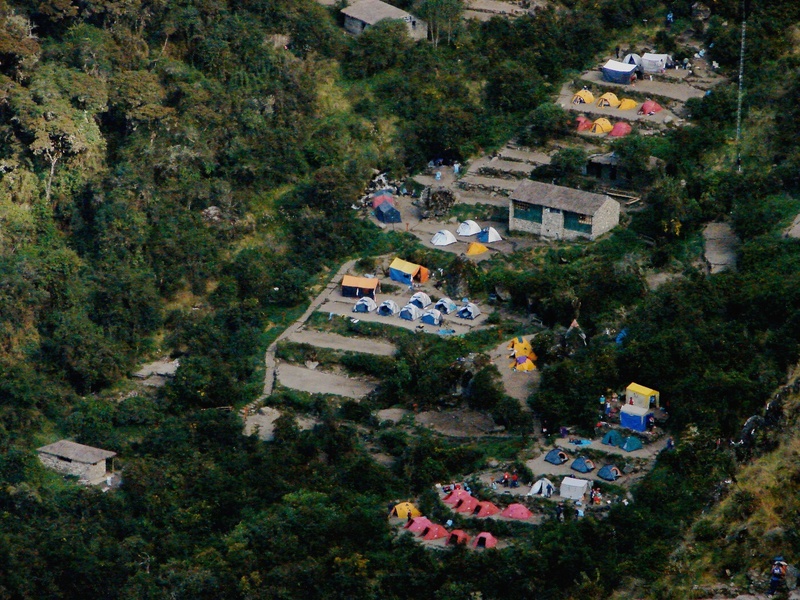 The classic Inca Trail trek starts when you get off the bus at km 82 on the rail line. Four days later and you are standing at the breath-taking site of Machu Picchu. 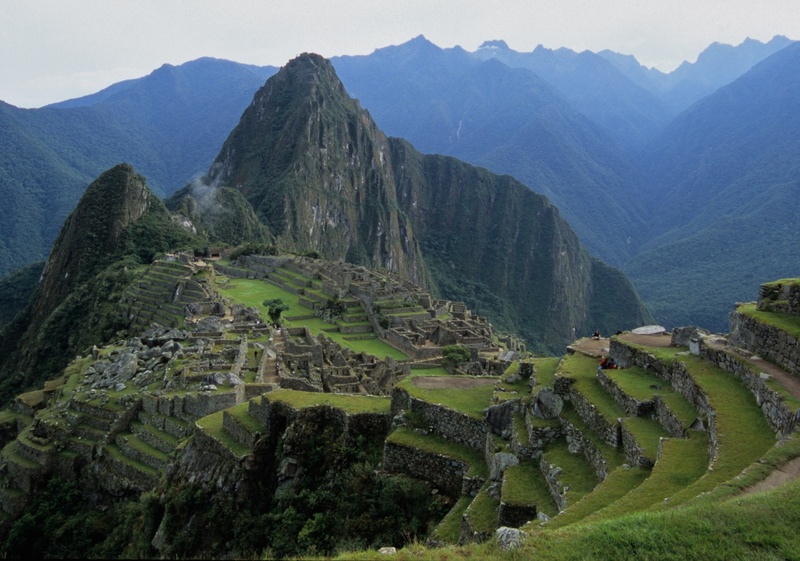 Interestingly, Machu Picchu’s altitude is only 2,430 meters (7970 feet), much lower than the Andean city you start from, Cuzco, which is at about 3,400 meters (11,200′). The year before I visited Peru, I spent almost two months in the Nepalese Himalayas. It too had been the trip of a lifetime! From Thorung La and Muktinath on the Annapurna Circuit to Kala Patar and Gokyo Ri in the Khumbu region… a steady stream of Wows. My interest in Hindu and Buddhist thought and culture provided another rich dimension to explore and appreciate. In the end, however, the political turmoil in Nepal and the logistics of getting there provided me with the impetus to focus elsewhere. That’s where Peru came into the picture! Instead of a flight from Toronto to Zurich to Delhi to- after a night in a hotel in Delhi- Kathmandu, it was 6 hours to Lima and then one hour to Cuzco. Admittedly, the wait at the airport in Lima from 1:00 a.m. to the first departure for Cuzco at 6:00 was a bit of a pain- but chatting with a well-travelled young couple from San Francisco made the time go by. I actually managed to stretch out and get a bit of sleep. I had left T.O at 6:00 pm. and by 8:15 the next morning was at the Hostal Marani in Cuzco – better by a day than my journey to the Kathmandu Guest House in the Thamel district of Kathmandu. I had spent the winter months learning some basic Spanish at the Spanish Center. I also read up on Peruvian history- both recent and Inca-related. Hugh Thomson’s books The White Rock and Cochinial Red definitely revved up my anticipation level a few notches; I started listening to, and liking Andean music (it’s called huanyo). The Rough Guide to the Music of the Andes cd and another, the Rough Guide to the Music of Bolivia cd both were on frequent play in mp3 format on my iPod for months, along with little snippets of conversation in Spanish for practice. Brad Johnson’s comprehensive guide to climbing in the Huaraz region, Classic Climbs of the Cordillera Blanca, complete with a dozen fabulous 3D maps, really helped me to visualize my upcoming trek and climbs in South America’s #1 climbing destination. 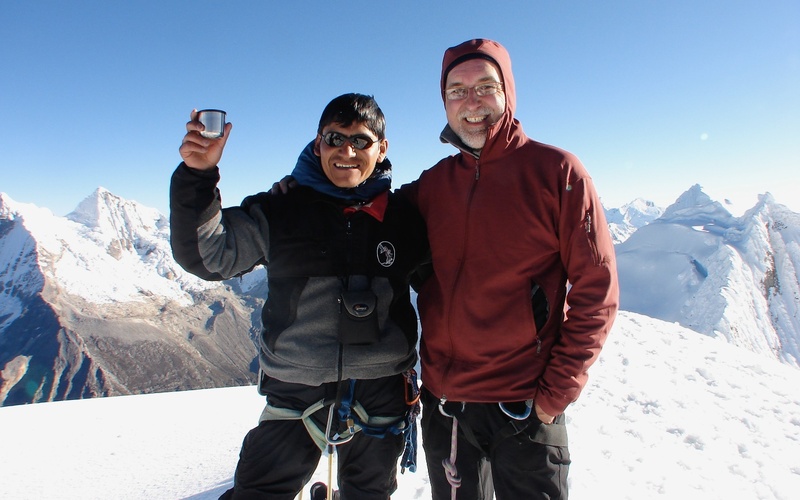 The best thing that happened was making contact with reliable trekking and climbing companies in Peru. I should mention that what I used to do is make use of Canadian, American, or British adventure companies for my trips. I now realize that by going directly to the source, I am cutting out one layer of cost and getting a better deal by about 30-40%. Like everything else though, there is that initial fear as you deal with people you don’t know. For me the “light bulb” moment came when I realized that the companies I was going with were in turn hiring the very local people that I could hire myself. Research and luck got me there, as did the willingness to take over the planning and organization of the details of the trip myself. For the Machu Picchu leg of my adventure I found SAS Travel in Cuzco to be everything it said it was. Since independent hikers cannot walk the Inca Trail, you need to find a reliable outfit to take you on your 45 km walk. Their guides, porters, cooks, and camp-set-up crew will take care of the details and you walk with a day pack containing camera gear, snacks and water, and rain gear. 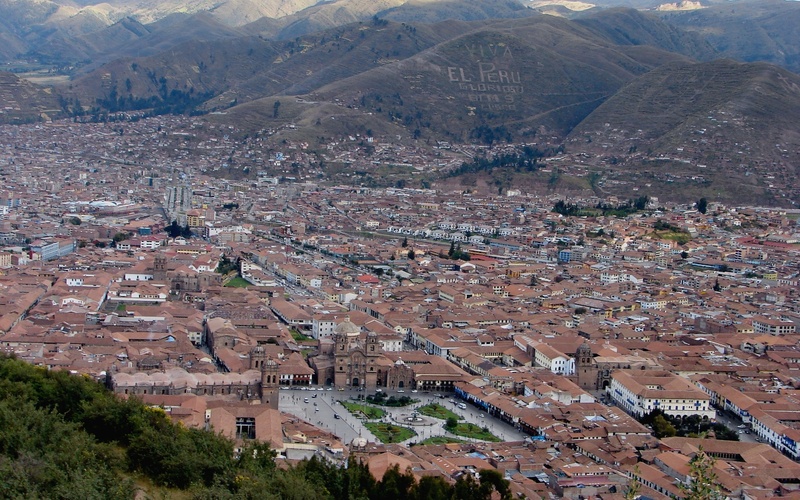 I booked my spot for May 11 about three months in advance- you can’t just show up in Cuzco and buy a ticket for the next day since the trek is so popular. I think at any one time there is a maximum of 2500 trekkers allowed- with another 2500 locals (mostly farming people keen to earn some hard cash) also on the trail catering to these “pilgrims”. SAS was first class all the way- great food (even for vegetarians! ), a roomy tent, super organization…the company has been doing trips for years and knows the routine. For the Cordillera Blanca part of the trip I had even better luck. Since the andeantravelweb doesn’t even mention them, I am not sure how I ended up wiring Peruvian Andes Adventures in Huaraz $1600. as an 80% deposit for my two weeks with them. Well, long story short, they were fantastic. In fact, a couple of years later I picked them to do the fifteen-day Cordillera Huayhuash Trek. Like SAS, they really know what they are doing and never give you the feeling that you are there to be fleeced! A Great organization from top- Hiseo and Eli Morales- to excellent guides and cooks and arierros (donkey drivers) and equipment- the second time I even stayed at the Morales Guest House, a new-ish venture for the family. Also standard is being picked up at the bus station on arrival and being driven back to the station on departure, with someone on the office team having purchased your ticket for you while you were off on the trek or climb! 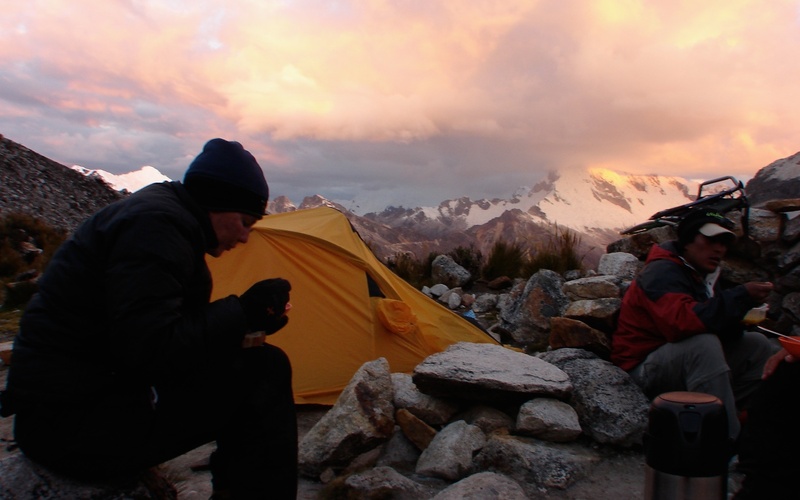 Huaraz and the walk up the Quebrada (Valley) Santa Cruz, and climbing Nevados Pisco, Inshinca, and Tocllaraju. 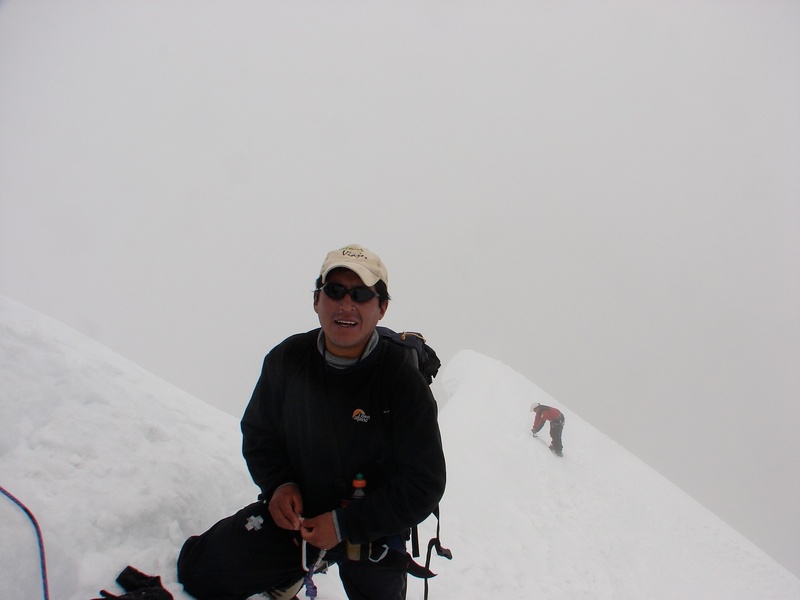 This entry was posted in hiking/trekking, mountaineering and tagged adventure travel, climbing Tocllaraju, cordillera blanca climbing, high in the andes, nevado tocllaraju, Peruvian Andes Adventures, Santa Cruz trek, SAS Travel. Bookmark the permalink.